Peter made our day so awesome! He is so professional yet treated us like we had known him for many years. I would HIGHLY recommend him to officiate any wedding. He’s flexible with times and schedules. Thank you so much Peter!!!!! Thanks Angela! You and Chris have a very nice family. I enjoyed everyone's company. Glad I could help you out! Peter was exactly what we wanted and needed in our officiant. He was dependable and we really enjoyed working with him. We’d highly recommend Peter to others. So happy we went with Peter. We just wanted a simple ceremony and he delivered. The process is so simple. Peter is a super nice guy, he got there a little early and mingled with our family/ friends. Picking out someone to marry us was a very scaring thought not knowing what you would end up with. But, then we met Peter. He was the perfect choice. We felt very comfortable with him officiating our wedding. He was super nice, great personality, flexible, responded to any questions, prepared us for what we needed to know/do, it just felt perfect. He really added to our very special wonderful day. Everyone that attended had nothing put nice things to say. Thank you Peter! Peter was a dream to work with. We wanted something simple and non-religious, and this was perfect. Communication was excellent, and he was flexible when we had to change dates last minute. We are so happy he married us! Thanks Hannah! I'm honored to have been a part of your special day. Wishing you and Brent much happiness in your life together! Peter did a wonderful job all around. He made the process easy and stress free. He was responsive and flexible, and he and his wife were a pleasure to be around. We got lots of compliments on our ceremony. I’d recommend him to anyone! Peter was very professional and very attentive to our requests. 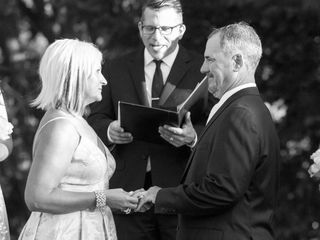 His years of experience as an officiant resulted in a flawless ceremony. Additionally, Peter is very personable and was ultimately a pleasure to work with! Mary Ann, it was a pleasure working with you as well. Thanks again! Definitely would recommend Peter! He made us feel so comfortable during a stressful time. We hate being the center of attention and he made the ceremony quick and easy, how we wanted. He was very professional and made us smile and laugh. Peter, hands down is the best! Peter was great to work with, very friendly and accommodating. He worked with us on all of our requests and made sure that our service was exactly what we wanted. Peter was great to have as an officiant. He responded quickly to all emails. He was always on time and would allow to you customize exactly how you wanted your ceremony to be. Would highly recommend. Peter was very professional and nice and did an amazing job with both the rehearsal and the actual wedding! You could tell he's done this for a while and knows it inside and out. We had gone back and forth a few times with Peter before we finally met him a couple days before our wedding, at the rehearsal. We weren't sure what to expect but we were so pleasantly surprised! He looked so professional and was so friendly to us and to our families. We felt a connection with Peter right away and from the start we felt that we had made the right choice. There were some things that we wanted to add to the ceremony and Peter was very accommodating. He wanted our ceremony to be as special as we wanted it to be. It was a beautiful ceremony! Thank you again, Peter! Peter was friendly, quick to respond, flexible, and extremely professional and experienced! Highly recommended! Peter did an absolutely wonderful job for our wedding! 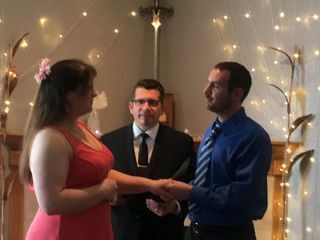 We both were extremely nervous on our big day, but Peter's experience, class, and charismatic attitude put us at ease and made our wedding go smoothly. His ceremony words were touching and thoughtful, and he made sure all of our needs were met. Within minutes of working with him, I could really see his passion for what he does shine through! 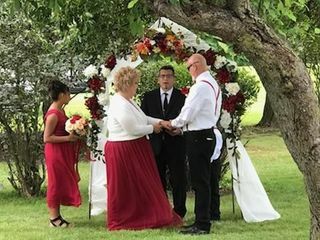 If you need an officiant for your wedding, I recommend Peter with the highest confidence that your ceremony will end up as amazing as ours did! Thank you Brendan! It was my pleasure. Wishing you and Karissa much happiness in your life together! 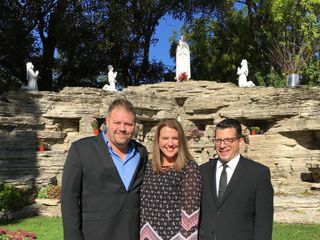 We had a wonderful experience by having Peter as our officiant! We couldn't have asked for a better person to marry us. Very responsive to emails and phone calls. Everything went perfect that day! If you are looking for someone who will make your day perfect, look no further! We wanted a very small private wedding at a location close to our home and everything turned out amazing. Peter was fantastic! He was very friendly and helped keep everyone calm and at our best. 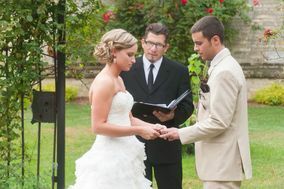 He was through and also able to accommodate our traditions and special requests and work them into his ceremony. 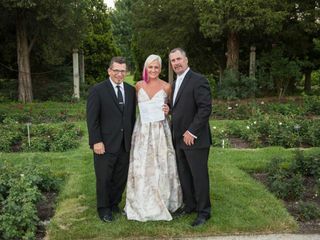 Peter is wonderful person, he performed our wedding with grace and made our ceremony very personal! We would highly recommend him too everyone! Thank you Peter for making our day so wonderful! Peter was a joy to work with and it was wonderful to have him preside over our wedding! Thank you Peter! We absolutely loved Peter. 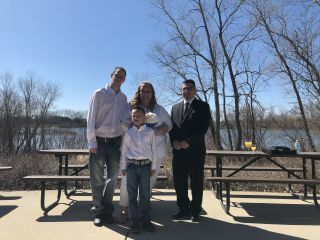 He was very responsive, and even helped us with witnesses for our secret elopement :) Very professional and we felt very comfortable having him perform our ceremony. He even came out in the freezing cold to do so. Highly recommend! We absolutely loved Peter!! He was extremely professional and was willing to work with us the entire time. We will be renewing our vows in 2018 and will definitely want him there. Whenever i had a question or concern he would email back immediately and was willing to give great advice, help us out, and be flexible. I would absolutely recommend him for anyone looking for an officiant! We are very grateful for finding him!! Thanks Taylor! It was a pleasure officiating your ceremony. If I can be of service to you in the future, please don't hesitate to contact me. Good luck to you and Heather! We are so pleased on how perfect our ceremony turned out. Peter did an excellent job and made us both feel comfortable on our wedding day and made sure that everything went smoothly. We received so many compliments on how wonderful the ceremony was. We contacted him not too long before our wedding date and he responded quickly over email. He showed up on time for our rehearsal and made sure that he had all the details. 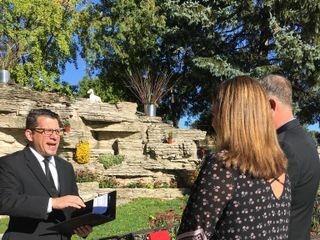 We definitely recommend Peter as an officiant and are so pleased on how everything went.